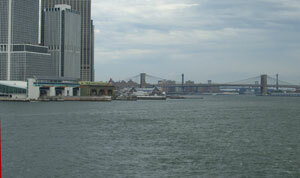 This past weekend, we scouted out some photo locations, beginning with the SI Ferry. We had just missed one, so we waited in the new terminal for half an hour before the next one arrived. 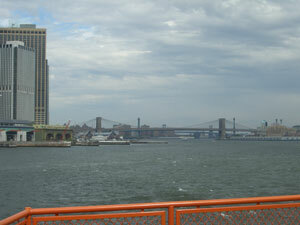 The day was very windy and it started to drizzle/rain as we boarded the boat so we stayed inside for the ride to SI. I think we stayed on the right side of the boat (I've forgotten all my boating terminology -- is it starboard?) 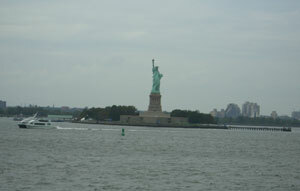 to get a view of the Statue of Liberty. Once we arrived in SI (about 20 minutes later), we had to get off, walk around, and wait to go back on the ferry for the return trip. This time around it was no longer raining and we went up to the top deck, where I think it'd be easier/nicer to take pictures uninhibited by the roof on the deck below. On our way back, we passed by the other ferry (the older one, which doesn't have a deck along the sides of the boat, just in the front and back, hence not optimal for many photo ops). As we approached Manhattan, I also noticed that the view on the other side of the boat is of Governor's Island, which provides a quaint background, something unexpected for New York. Then we drove to DUMBO, in search of a nice cobblestone street to take pics with the cab (didn't really find any). 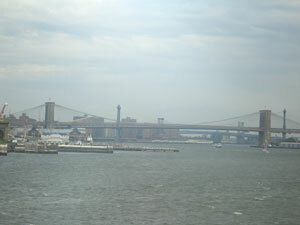 We also located Brooklyn Bridge Park after much turning and driving through bumpy one-way roads. The park has awesome views of both the Brooklyn Bridge and the Manhattan Bridge (too bad my camera decided to malfunction at this point). Next to the BBP is Empire-Fulton Ferry State Park, which has the remains of an old tobacco factory (and now used for parties) and other interesting old structures. However, if you were to take wedding pictures in that park, it costs over $100. After many phone calls to the NYC Parks Department, the consensus seems to be that taking pictures in a city-owned park is free, if you're in a group of 25 ppl or less, and so long as there is no special setup required. So it's decided -- we will take pics with the bridal party in DUMBO, with the cab, and at Brooklyn Bridge Park after the ceremony (I think we can get some fun, interesting, playful pics there). 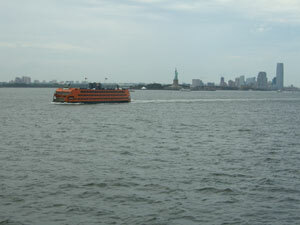 Then just the two of us will go on the SI Ferry (the wind and all will mess up our hair and such, so best to save for last) and by then we'll have spent maximum time with the cab (rather than letting it sit, waiting while we ride the ferry for an hour). Great choice on DUMBO/Brooklyn Bridge Park as a photo venue! When all this ccraziness is over, we'll take you to our favorite spots for brunch/dinner down there. I promise there'll be no roaches or vermin served too! The Brooklyn Bridge Park and Fulton Pier in DUMBO will make for wonderful photos. The location is a magnet for couples looking for the quintessential NYC backdrop. Bonus is that I get to walk home aftewards to rest up before the banquet while you guys cruise to SI! 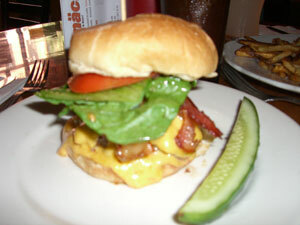 As for Schnack, next time try the Henry St Ale House in the Heights, my favorite spot for burgers in the hood.